Try out our service for free! Click here to download our RideKC App. First ride is on us! New service to New Century Parkway and Logistics Park KC is being added to 595 Gardner-OP Express, effective Monday, April 2, 2018. This will improve access to jobs in southern Johnson County. 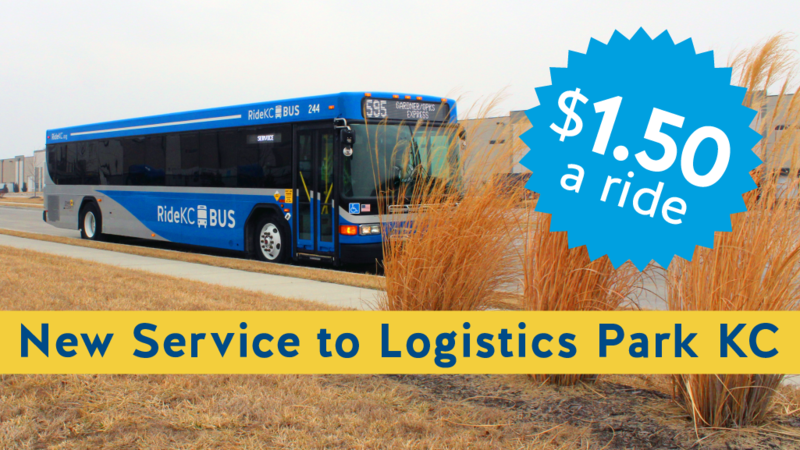 The expanded service will travel from downtown Kansas City, Mo., and downtown Kansas City, Kan., and reach businesses in Gardner and Edgerton. The increased service includes Saturday service on the route. On weekday mornings, 595 will add three trips from Kansas City, Mo., and three trips from Kansas City, Kan., to Logistics Park KC, ending at 193rd & Essex. 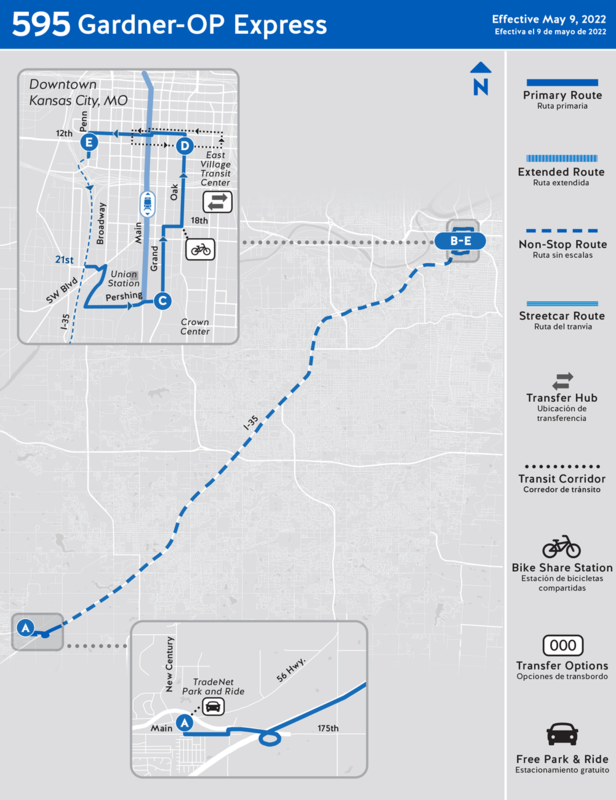 Additionally, three of the six trips from Johnson County to downtown Kansas City, Mo., will begin at Logistics Park. On weekday afternoons, 595 provides the reverse service. Existing commuter service from TradeNet Park & Ride and Oak Park Mall Park & Ride to Downtown will be expanded as well, with one additional northbound trip and two additional southbound trips. However, all scheduled times will change slightly. Check the new schedules for new times. Additionally, 4th & Nelson, Center & Main, and New Century Parkway & Lenexa Parkway will not be served on northbound morning trips or southbound afternoon trips. 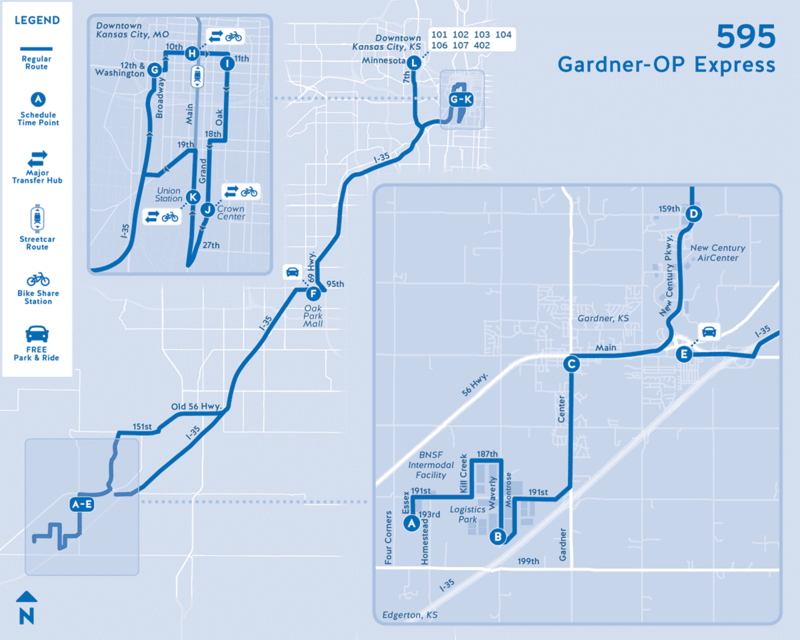 595 Gardner-OP Express also adds Saturday service. 595 will offer two morning trips from Kansas City, Mo., and one morning from Kansas City, Kan., to Logistics Park KC, ending at 193rd & Essex. Additionally, 595 will have one trip in the morning from Logistics Park to downtown Kansas City, Mo. On Saturday, 595 provides the reverse service. Destinations on the 595 include Downtown Kansas City, Kan.; Downtown Kansas City, Mo. ; Crossroads Arts District; Crown Center; Union Station; Oak Park Mall (weekdays only); TradeNet Publishing Park & Ride location (weekdays only), Downtown Gardner, Kan.; New Century Pkwy. & AirCenter; and Logistics Park in Edgerton, Kan. See a map of the route.